Unlike other people involved in the sport, the game-makers haven’t let football’s governing body down! Before you decide whether to buy it, though, have a look at the excellent TV ad promoting the game – because it explains what the whole concept behind the game is really all about. The whole idea is that FIFA 15 puts you in the heart of the football action in a way that no other game has hitherto managed. And it goes a long way to achieving this aim – as the TV ad explains to good effect. The ad depicts Lionel Messi playing at home. He takes a flying volley which hits the back of the net – but then he is then suddenly on the pitch. You have to see it to see what we mean, but it is extremely well created. 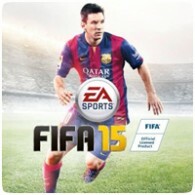 The developers EA Canada have done a great job in developing and improving number 15 from FIFA 14 – which was pretty damn good itself. With this latest version, released in September 2014, you can choose from several hundred different football teams from leagues all over the world. This is great for simulating matches that could never take place and for those of us who enjoy a bet on the football, its good fun to play a few virtual match-ups of the weekend’s fixtures, to get an idea of how they might pan out in real life. Take Chelsea for example, who have dominated the early Premier League title betting. After two minutes of matchmaking, you can find yourself on pitch level at Stamford Bridge, taking control of Cesc Fabregas and Diego Costa to name but a few. The improvements mean ball possession feels better than before. It feels more realistic and this also helps make both dribbling and tackling harder, but also much closer to the real game. The ball moves in a different way as well. This takes some getting used to, but again is better and more realistic and offers more opportunities for different kinds of play. On the downside, the career mode is a little disappointing because it doesn’t have the depth some FIFA series fans were hoping for. But otherwise, FIFA 15 is as good as it ought to be when it carries this kind of endorsement. It also does what the ad says – it will and puts you right in the action. The developers and FIFA must know that all gaming and football fans are going to buy it anyway – but given all that, they certainly haven’t let us down.